The Congregational Accessibility Network commends these additional resources for congregations through other church and religious groups. You are also invited to share your thoughts, questions, and suggestions by using the contact information in the left column of this page. Third edition (2010) by Charlotte Hawkins Shepard, PhD and the Rev. Dr. Devorah Greenstein. Prepared for United Methodist Committee on Relief – Health, General Board of Global Ministries, the United Methodist Church. Download and use this free 63-page detailed guide to creating accessibility in church buildings. 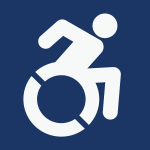 Includes information on a full range of disabilities, manufacturers of specialized products, links to related portions of the Americans with Disabilities Act, and much more. Published by the National Council of Churches of Christ USA. This is a good resource for those planning conferences and other large meetings. Originally published by the Alban Institute and the National Organization on Disability. It describes creative initiatives and fund raising strategies used by 50 congregations to become more accessible to people with all types of disabilities. Accessible Faith Publications from the Retirement Research Foundation. Two publications are featured, both freely downloadable in PDF format: Accessible Faith: a Technical Guide for Accessibility in Houses of Worship and Accessible Faith in Illinois. The first is a 50-page national guide to help religious congregations navigate building-related code requirements for accessibility, identify design solutions for common physical, auditory, and visual barriers, and provide technical guidance on planning, financing, contracting and incorporating access into their houses of worship. The second provides an overview of the State of Illinois requirements and how they pertain to Illinois houses of worship. Instructions are also provided for purchasing hard copies for a nominal fee. Another buildings checklist focusing on removing existing barriers in older buildings.